Computational Aesthetics draws from both a long history of artistic expression and the possibilities that computational methods can provide. As such, its success depends on a dialogue between the arts world and computer science. Based on the experience we gained through an art-computer science joint project on non-repetitive patterns we attempt to document our personal dialogue, to analyze the experiences we gained from our collaboration, and to extract insights we gained with respect to computational aesthetics. 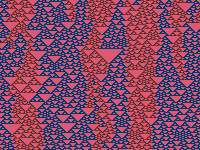 You can try an online demo of the project (Java applet) described in the paper; one change was made to the code used in the interactive art piece: the pattern does no longer unfold slowly for newly created patterns or newly created starting lines but is displayed completely right away (for better and faster exploration of the pattern space).